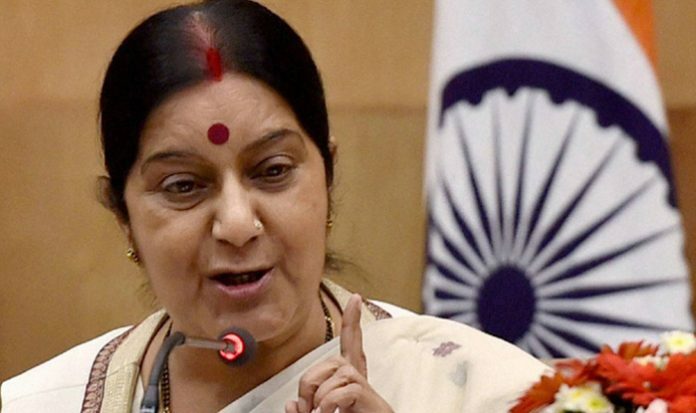 New Delhi, Jan 12 : External Affairs Minister Sushma Swaraj on Saturday left for a two-day visit to Uzbekistan to attend the first India-Central Asia Dialogue. With the participation of Afghanistan, the participants of the Dialogue will also deliberate on developing viable connectivity options between India and Afghanistan and Central Asia to further facilitate trade and economic activity in the region, officials said here. “Building upon shared history & culture. EAM Sushma Swaraj emplanes for Samarkand to participate at 1st India-Central Asia Dialogue. EAM will co-chair Dialogue with Uzbek Foreign Minister Kamilov. Foreign Ministers from other Central Asian countries and Afghanistan will attend,” MEA spokesman Raveesh Kumar tweeted. Ms Swaraj will co-chair the Dialogue along with Abdulaziz Kamilov, the host and the Foreign Minister of the Republic of Uzbekistan. “The Foreign Minister of Afghanistan will participate in the Dialogue as a special invitee for the Session dedicated to connectivity issues in the region. Foreign Ministers of the Kyrgyz Republic, Tajikistan and Turkmenistan and the First Deputy Foreign Minister of Kazakhstan will represent their respective countries,” an MEA statement said. “Bound together through shared history and cultural linkages, India and the Central Asian states look forward to the Dialogue as an important initiative to enhance their cooperation in wide-ranging spheres including exploring ways to substantially enhance India’s economic involvement in business and development sector of Central Asia,” it said. Following Prime Minister Narendra Modi’s landmark visit to all the five Central Asian countries in 2015 and External Affairs Minister’s Central Asia tour in August 2018, the India-Central Asia Dialogue, with the participation of Afghanistan, is expected to strengthen India’s engagement, including political, economic, development partnership and cultural, with all the Central Asian countries and take it to a new level, the MEA statement has said.